Share the post "Preliminary Experience with Uterine Artery Embolization Follow Up"
This study was undertaken to investigate the efficacy of transcatheter uterine artery embolization in treating uterine fibroids and related symptoms. Eleven women with vaginal bleeding or pelvic pain, clinically determined to be related solely to uterine leiomyomata, underwent uterine artery embolization with the use of polyvinyl alcohol particles. Each patient, none of whom had any desire for future fertility, previously had been treated unsuccessfully with hormonal therapy. Ten patients had a bilateral embolization performed, and one patient had a unilateral embolization performed. All were technically successful. Three weeks after the procedure, one patient developed a fever that persisted despite treatment with antibiotics. She underwent hysterectomy after a large, fluid uterine mass was found on computed tomography. The histology showed fibroid tumor shrinkage with necrosis and endometrial necrosis within endometriosis. Follow-up information, in the form of a questionnaire completed 2 to 9 months postprocedure, was available for 9 of the 10 patients without complications. Three of them experienced complete relief from their principal complaint (bleeding or pain), four had significant improvement, and one reported slight improvement. The patient who had undergone a unilateral procedure had no improvement in her symptoms. Vaginal bleeding resolved completely for one of the seven women who had this symptom, was significantly improved in three, and slightly improved in two. Three of the nine patients with pelvic pain had complete relief, four had significant improvement, and one reported slight improvement. Ultrasound evaluation before embolization showed uterine enlargement in all 11 patients. In nine women, there was diffuse heterogeneity suggestive of myomatous change. Ten patients had multiple visible masses (4 submucosal, 10 intramural, and 4 subserosal). Follow-up evaluation was available for nine patients (one patient had no information on uterine size). Ultrasound showed a significant reduction in uterine dimension in all eight patients reported (P < .01). Uterine volume was reduced by an average of 40 percent. Dominant fibroids were no longer detectable in three women, improved in four, and showed no change in one. This patient did, however, show a large reduction in the overall uterine size and experienced excellent clinical relief. 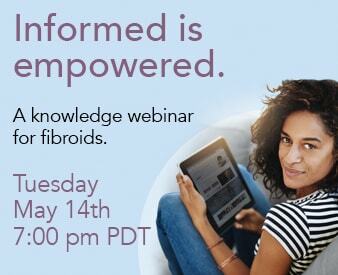 For all patients, the average reduction of fibroid volume was 59 to 66 percent. After the procedure, seven patients had crampy pain necessitating a single intravenous dose of narcotics for two patients and oral analgesics for another two. Overall, seven of the eight patients who had some relief of their preprocedure symptoms reported satisfaction with the outcome and said they would repeat the procedure if symptoms recurred.